(The original Latin text was “Apud Hergan .v. pauperes; apud Otteford .v. ; apud Cliue .ii. ; apud Grauenea .ii. ; apud Oesuualun .vii. ; in ciuitate Dorobernia .vi. Unicuique detur cotidie ad manducandum quod conuenienter sit satis et per annum cuique pauperi ad uestitum .xxvi. denarii”). A list of mother churches and their subsidiary churches made for Archbishop Lanfranc of Canterbury soon after his ordination in 1070 records “Nunningitun” as being a subsidiary church, in effect a chapel, “Ad Wingeham”. This chapel became a church in its own right when the parish of Nonington was formed by Archbishop John Peckam: “On August 2nd 1282 Archbishop John Peckham founded the College of Wingham, a college of secular canons consisting of a provost and six canons, divided into four parishes as follows: Wingham; Esse (Ash); Godwyneston (Goodnestone) with the hamlets of Bonnington, Offington (Uffington in Goodnestone parish), Rolling, Newenham, underdone together with parts of Tuicham (Twitham, near Staple) and Chileden (Chillenden) and, lastly, the church of Nonington with the chapel of Wymelingewelde (Womenswold) and the hamlets of Rittlynge (Ratling), Freydeville (Fredville, almost certainly what was usually referred to as Holt Street), Hesol (Easole), Suthnonington (South Nonington, the hamlet around the church), Hakeholt (Ackholt), Catehampton (Kittington), Attedane (Oxenden, later Oxney ? 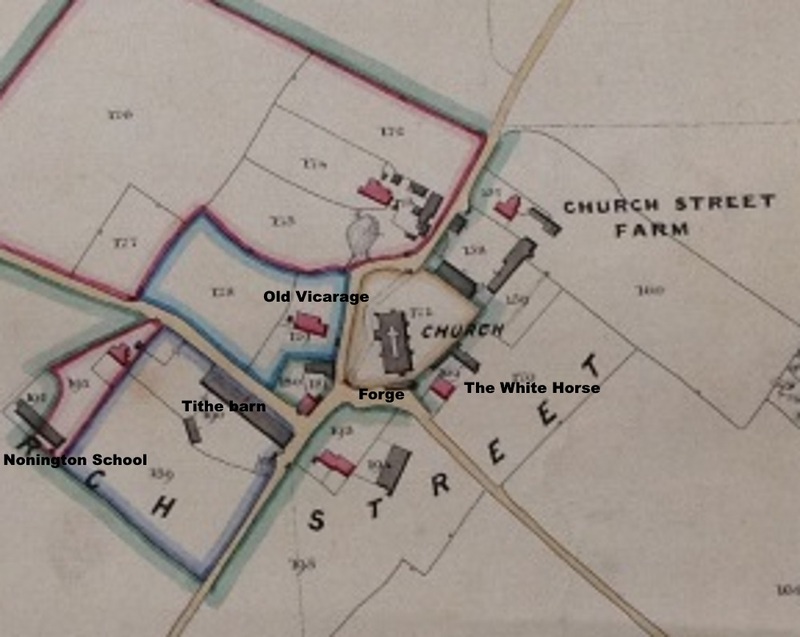 ), Wolshethe (Woollege, now part of Womenswold parish), and Vike (Wick, also now part of Womenswold) ‘some of which have been fixed in well-proportioned parts, which vicars are so far held without hindrance’. On June 7th 1290 King Edward I gave his consent to the formation of the College. The six canonries were: Bonnington, Chilton, Pedding, Ratling, Twitham, and Wymlingswold (Womenswold), “so named after the places of their endowment”. (From ‘The Chronicles of Wingham’ by Arthur Hussey). (From: Arch Cant. Vol 32, p 169. Visitation rolls of 1294). “Nonyntone. The chaplain holdeth the Altarage and the fruits to farm, causes the tithes to be collected and manages everything. A year has elapsed since the wife of Robert Holestrete died. The chaplain has much land and busies himself much in secular affairs. There is no resident rector nor is anything known concerning any ordination (of a vicarage).As regard matrimonial causes the Provost investigates those that are to be wound up in the appointed manner. Visitations are made in the church of Nonington, ect. By Thomas the Chaplain of the Church, and Ralph atte Bery, John Borfys, Robt. Acholt and Sampson atte Napiltone. The missal is incomplete (insufficiens) as it was last year, and the church has not been repaired. Wherefore the parishioners are to be summoned to shew cause why they should not be compelled to pay the penalty, and they are again enjoined to repair the said defects under pain of 40s. Also they lack a Matyrology, a manual and frontal for the alters in the nave of the church. The nuns of St. Sepulchre, Canterbury, take tithes in the parish, by what right is unknown. The abott and convent of St Alban’s take certain tythes, by what right is unknown, and they sold the same that year at one time and in gross (simul et in summa). Thomas, the chaplain, holdeth the Altarage and all the fruits to farm. The rectors do no alms in the parish. John of Canterbury, chaplain, celebrating in the said parish hath no books and he is suspected of not saying matins and his service because he is a wandering fellow (vagabubdus). Nor is he careful to keep a record of his service (servicium suum recordando)”. “CHAPEL OF NONYNGTON. The parishioners of Nonyngton exhibited a bill, stating that persons having lands and tenements within the said parish, refuse to share the burden of repairing the church with the inhabitants. Item, that some withdraw legacies bequeathed to the church, as in the bill. The chaplain and parishioners say that the canons of the college withdraw £4 of annual pension belonging to the said chaplain.”. The chaplain in 1511 was Sir Roger Tolus or Tolns; the wardens were Richard Roger and Nicholas Andrew; whilst the leading parishioners were shown as John Boys, Robert Austyn, Stephen Deyll and Symon Quylter. “CHAPEL OF WYMONDLYNGWELD. The parishioners presented a bill against John Nethersall and Thomas Snoth, of Birham, stating that he withdrew the goods of the church, as appears by the bill”. 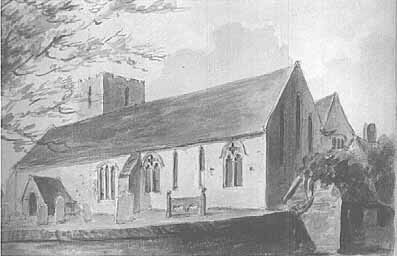 The chaplain in 1511 was John Cargill, the wardens were John Gorham and Thomas Best, whilst the leading parishioners were shown as William Goost and William Aden. “Nonnington:- Lieth about the middle of the East part of the County, about five miles (towards the southwest) distant from Sandwich, in the Bailiwick of Eastry, Lath of St. Augustine, East Division of the County, and division of Justices to that Lath. Part thereof in the Hundred of Eastry, and the residue in the Hundred of Wingham. The liberties of the late Archbishop of Canterbury and St. Augustine claim there, and the liberty of the late Dean of Canterbury claimeth over so much thereof as is within the Mannour of Eastry. It was all in the Deanery of Bridge and Diocess of Canterbury. 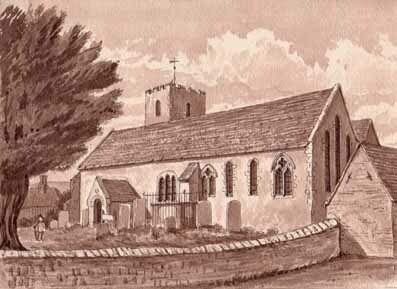 “The Church standeth in the Hundred of Wingham, was called St. Maries, and was antiently a Chappel to Wingham, But in the year 1282 (upon dividing of Wingham into foure Parishes) this was one of them”. (A Topographie or Survey of the County of Kent. With some Chronological, Historicall, and other matters touching the same: And the several Parishes and Places therein. By Richard Kilburne of Hawkhurst, Esquire. Published in 1659). “THIS PARISH is within the ECCLESIASTICAL JURISDICTION of the diocese of Canterbury, and deanery of Bridge. Edward Boys, esq. of Nonington, by his will in 1596, gave towards the maintenance of a minister, being licenced and preaching every other Sunday at farthest at Nonington, yearly, for ever, all the profits of the small-tithes of Nonington and Wemingewell, (excepting those of the lands in his occupation, and the oblations and obventions due out of them, and the tithes of wood of all the lands and farms he had, or his heirs should have, within the parish) the said minister paying to him and his heirs the yearly sum of 40s”. (The History and Topographical Survey of Kent, volume IX, by William Hasted, published in 1800). 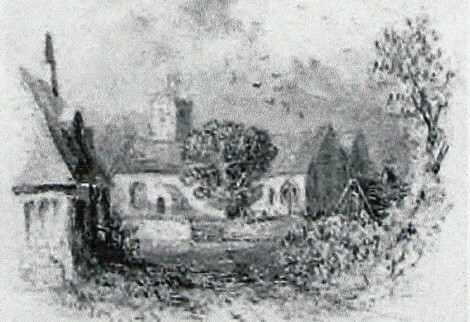 Nonington Church, 1807, artist unknown. 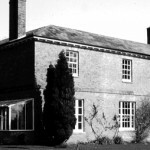 “This edifice possesses monuments of the Hammond’s, the Boy’s, the Trotter’s and the Wood’s. In the window’s were formerly shields of armorial bearings in stained glass, &c. long since destroyed. This structure formerly ranked a chapel of ease to the church of Wingham; and, on the foundation of the college by Archbishop Peckham, separated from the same, and constituted a distinct parish then vested in that institution, and so remained till the suppression. By Queen Mary, in 1558, it was granted to the archbishop; but the rectory, with the chapel in Wimlingswold, continued vested in the crown till the 3d of Elizabeth, when it was granted in exchange to the primate of Canterbury, being valued at £33; reprises to the curate £13-6-8; at which rental it has continued to be leased, and remains part of the possessions of that see. 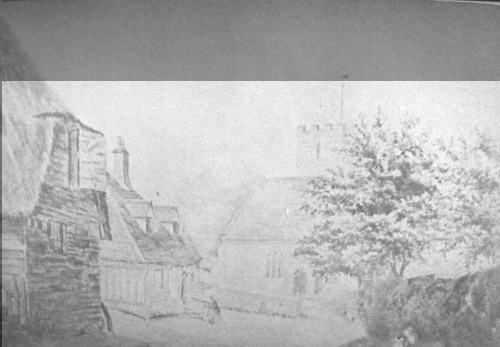 When this church was appropriated to the college of Wingham, a vicarage was endowed in the same, which, on the suppression of the college, was esteemed a perpetual curacy. It is not valued in the king’s books. The ancient stipend paid to the curate was in 1600 augmented by Archbishop Juxon, with an additional £20; but, by the addition of a legacy, bequeathed by Mr. Boys, of the small tithes in this parish and Wimlingswold, it became, with the chapel, of the annual value of £71-6-8. In 1588 there were 235 communicants in this parish”. ( The County of Kent by W.H.Ireland,volume 1, published in 1829). “The living is a perpetual curacy, with that of Womenswould annexed; patron and appropriator, the Archbishop of Canterbury: the appropriate tithes have been commuted for £600, the perpetual curate’s for £250, and those of an impropriator for £170. The church is principally in the early English style”. (A Topographical Dictionary of England, by Samuel Lewis, 1848).